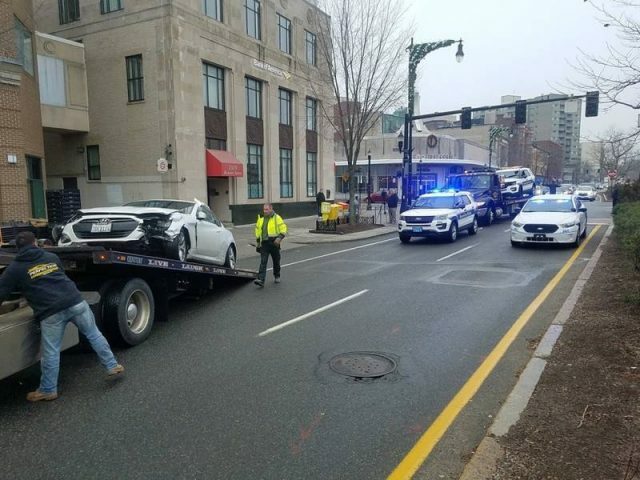 Brookline police are using the word “lucky” to describe the outcome of a non fatal crash involving a police officer in his police SUV and a woman driving a sedan in Coolidge Corner, that ended with her car up on the sidewalk next to Trader Joe’s. Both the officer and the woman were taken to the hospital, said police, and both are expected to be OK. No passersby were reportedly harmed in the incident. The woman did not sustain any serious injuries but a friend described her as distraught. 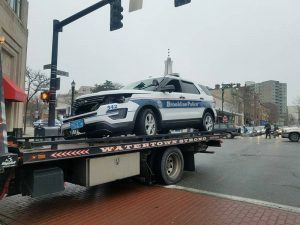 The officer was responding to a call when he turned onto Beacon Street, according to police. The woman was driving inbound and the two collided, spinning the police cruiser around and sending the woman in her car up onto the sidewalk, bouncing off of a lamp pole and skidding down past the post box and newspaper boxes before it came to a stop in front of Trader Joe’s, according to police. The lamp pole only appeared to have a large couple of scratches on it. Tire skid marks on the sidewalk and small pieces of the cars were all that was left of the ordeal by 8:00 a.m.
A woman said she was a friend of the woman who was injured in the crash said the driver had a green light at the time of the incident and described the woman as having “terror at the experience of being shoved onto the sidewalk due to sheer impact,” she said but declined to be named because she said she did not want to speak for her friend. The crash closed down the inbound side of Beacon Street just as the morning commute was getting underway. Police routed drivers down Harvard and around the section of Beacon for less than an hour. By 7:30 a.m. the police SUV and the woman’s white Hyundai were towed and traffic was resuming. “I’m just glad this happened so early before more people were here,” one officer told a man who appeared to be a DPW worker looking at the struck lamp post for damages after the cars were both removed from the scene.